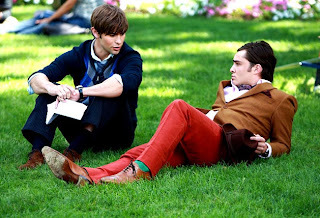 Oh Chuck in red trousers! I'm surprised Blair's mom is not going to start dating Rufus. I'm GLAD that's not going to happen. Little J with tude must be returning and that's a good thing. But most of all, I just want more Chuck Bass!